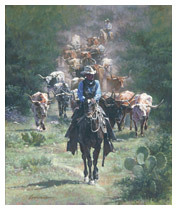 The word “giclee” (pronounced ghee-clay with a soft g as in gigi) is french meaning “to spray”. A revolutionary, high tech inkjet printer that uses six colors of ink is used to spray microscopic dots, creating prints of incredible clarity and detail. 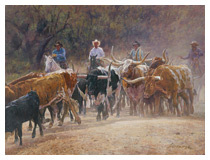 Printed on premium canvas and coated with a UV protectant, this method produces such high quality prints that they are barely distinguishable from the original oil paintings. 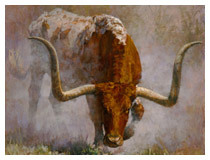 The first painting, entitled "Longhorn Storm" symbolizes the beginning of the Mack Brown era with the Thunderstorm symbolizing the building support and the charging longhorns portraying the excitement of the new program. 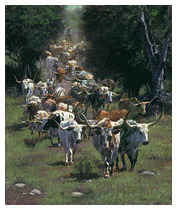 The second painting, entitled "The Climb to the Top," depicts longhorns working up a steep hill, symbolizing the teams effort to work their way up in the national rankings. 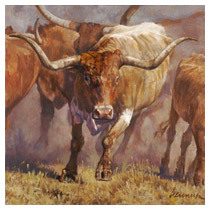 The final painting is called "Dawn of a New Longhorn Era". 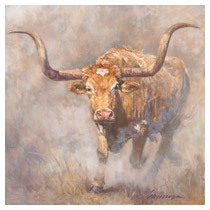 The longhorn stands proudly at the top of the highest point in the rich dramatic first light of morning, symbolizing the winning of a national championship. 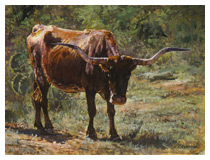 All "Trilogy" prints are signed by Coach Darrell Royal and Coach Mack Brown, the only two U.T. coaches to win the national championship. Copyright @ 2019 Ragan Gennusa. All rights reserved. Reproduction, adaptation and public display, in whole or part, are prohibited under penalty of law.